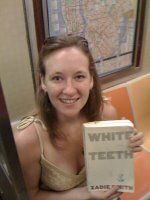 Underground Reads - NYC Subway - Tube Next? The London Underground is a great place to read and I often see people on the Tube reading the same book or the same book as me. It's a like a book group but with no one actually speaking about their books. Last week I saw two women (pictured above - who really looked slightly similar too), both reading Patrick Gale's Notes from an Exhibition. I couldn't resist taking a picture as I've never seen complete strangers reading the same book side by side like this before. On Saturday I spent the day with my old college friends and we were talking about book groups & I showed them this photo. Two of them had read the book. One of them was in love with Patrick Gale and thought the book was fab. One was a bit sceptical about book groups as she felt that there was a worrying level of competitiveness in them and that people felt that they had to devise fantastic pitches to get their book selected to be read. Then a further worry of coming up with intelligent questions to get the discussion going. Add to that another worry about finding something smart to say when you'd read the book, to her equalled nightmare which took all joy out of reading. I disagreed as I belonged to a large London Book Group for about 18 months and I never felt we had that level of competitiveness displayed. We read some great books and I discovered books that I now love which I might never have discovered without the book group. When I see a lot of people reading the same book on the Tube, I often use that as a recommendation of sorts. Or I feel like giving a thumbs up or a big smile to someone who's reading a book I've read, or even something by the an author I like. I'm a Paul Auster fan, so really wanted to ask the bloke reading New York Trilogy above, what he thought of it. Rob Hinchliffe Qype's Community Manager told me about a great blog which shows what people on the New York Subway are reading - Underground Reads. Garth Wolkoff is going round watching what people are reading on the Metro and asking them for a quick review or even asking for a picture of the traveller with their book. It's a great idea and creates an online book group of sorts. One without any competitiveness and no pressure to actually read the books if you don't want to. What do you think? 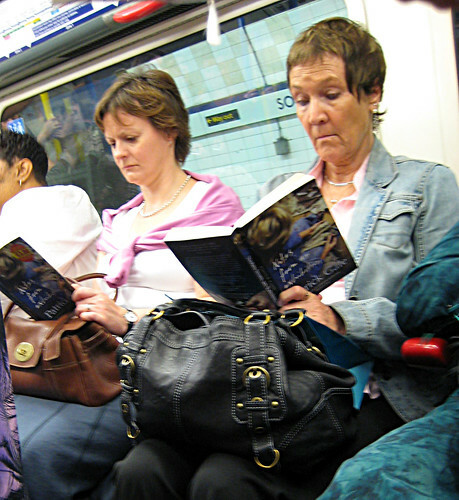 Do you read books a lot on the Tube or do you stick to papers? 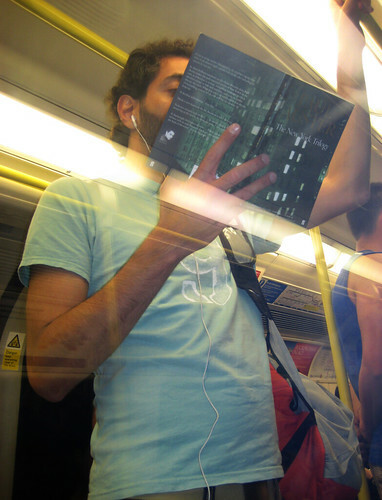 What happens when you see people reading the same book as you - have you ever asked them about it - or like me do you just smile to yourself, happy in the knowledge that you're in a secret London Tube Book Group?